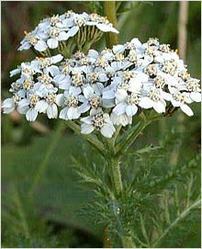 Common Name : Common Yarrow, Bloodwort, Sneezewort, Soliders Friend. Habitat : Found in the himalayas at an altitude of 1,000 - 3,600 m from kashmir to kumaun. Uses : It is anti-inflammatory, antiseptic, antispasmodic, aromatic, carminative, cholagogue, diuretic, digestive, emmenagogue, stimulant, homeostatic, vasodilator and tonic. It is useful in curing cold, influenza, heavy chest colds, chicken pox, diabetes, fever, flu’s, measles, menses, menorrhagia, soreness, piles, stomach sickness, flatulence, heartburn, colic, liver diseases, toothache, ulcers, infections, swelling and urinary diseases. It is also helpful in curing internal and external bleeding, blood clots, and act as blood-purifier and tones blood vessels. The leaves and flower heads are used as a tonic and vapor bath for fever. It has hypotensive effect.